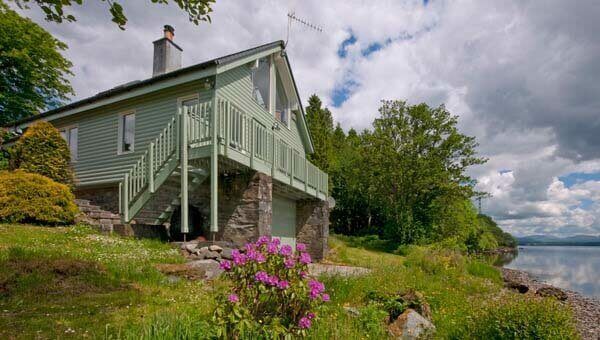 Lochawe Boathouse is located in the beautiful West Highlands. Loch Awe, the longest freshwater loch in Scotland, runs south west from about 20 miles east of Oban and is one of the most beautiful and most photographed of the Scottish lochs. At the northern end of the loch is the iconic ruin of Kilchurn Castle. About a quarter of the way down its peaceful western shore and right on the water, is Achnacarron Boathouse. The boathouse is a luxury lochside escape for couples, honeymooners or friends (there are 2 bedrooms) looking to escape the chaotic congested environment we live in. 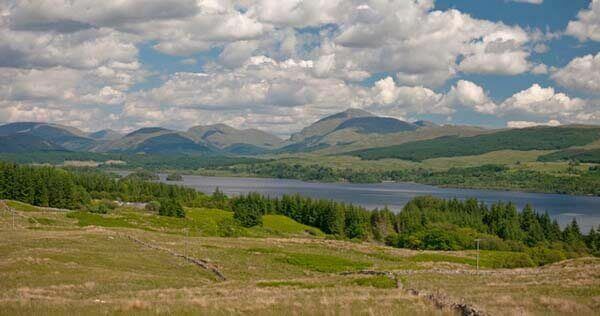 The panoramic views on the shores of Loch Awe are truly stunning. Loch Awe Boat House is the ideal venue for small and intimate weddings and the owners will assist you with local suppliers to make your day perfect. Standing in six acres of secluded, south-facing grounds with loch frontage the boathouse is reached by a mile of meandering private single farm track, which will bring you to this haven of peace and tranquility. The boathouse is an architect-designed, expertly refurbished and most comfortable house, quite alone in its stunning lochside situation. Surrounded by beautiful gardens and mature wooded areas, Achnacarron Boathouse is sheltered by a variety of magnificent trees. 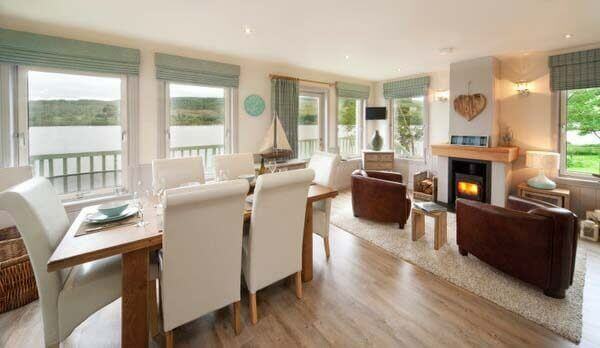 There is parking alongside the house, which also has its own private pier, slipway and fishing rights. As you would expect in such a location there is an abundance of wildlife here including deer, pine marten, red squirrels and otters and an even greater variety of birds, including barn owls and osprey. This is the perfect place to unwind and relax. With fishing boats pottering about on Loch Awe, and nearby mountains such as mighty Ben Cruachan, this is some of the best scenery in Scotland. Although it feels like you are staying in the wilderness, the location is surprisingly accessible, only 20 minutes down a single-track road from Taynuilt. 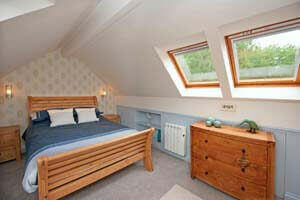 Lochawe Boathouse is a most comfortable house, quite alone in a stunning lochside situation. Downstairs has a contemporary kitchen/dining area and stylish and comfy seats by the wood burning stove with ample wood for cosy nights by the fire. There is Wi-Fi throughout and a TV/DVD player. There is a small library of films and books and a digital Roberts’s radio/CD player mini i-Pod dock system. The boathouse is well equipped with fridge, electric hob/oven, dishwasher, microwave, Nespresso coffee machine and all the things needed for cooking lovely dinners. One of the highlights is a beautiful deck where you can enjoy a glass of something chilled and take in the amazing views over the water to the woodlands and hills beyond. The master bedroom is also located on the ground floor with modern en-suite facilities, including a fantastic power shower and comfy bed. There is also another bathroom with power shower, a very useful drying room and utility room with washer-drier and freezer. 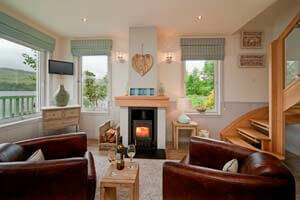 Upstairs offers a cosy living room with large glass wall offering panoramic views across Loch Awe with a TV/DVD player. There is another good-sized double bedroom with plenty of storage - ideal if you are two friends on holiday together so you each have your own bedroom. Directions by car from Glasgow Airport – Two hours via Erskine Bridge, Dumbarton, Loch Lomond, Tarbet and Inverary: Take the M8 towards Greenock then take junction 30 over Erskine Bridge and the A82 towards Loch Lomond and Tarbet. At Tarbet take A83 to Inverary then the A819 to Loch Awe. You will arrive at a T-junction, which is at the top of Loch Awe. Take a left onto the A85, Follow this road through the village of Loch Awe then pass through Bridge of Awe, after a further two miles you will reach the village of Taynuilt. Car directions from Glasgow Airport – Two hours. Via Erskine Bridge, Dumbarton, Loch Lomond, Tarbet and Inverary: Take the M8 towards Greenock then take junction 30 over Erskine Bridge and the A82 towards Loch Lomond and Tarbet. At Tarbet take A83 to Inverary then the A819 to Loch Awe. You will arrive at a T-junction, which is at the top of Loch Awe. Take a left onto the A85, Follow this road through the village of Loch Awe then pass through Bridge of Awe, after a further two miles you will reach the village of Taynuilt. As you enter Taynuilt slow down and turn left onto the B845 - a single-track road leading to the hamlet of Kilchrenan (5 miles). After passing the Kilchrenan Village Hall on your left and the church on your right, slow down and turn left at the Kilchrenan Inn. Drive past the door of the pub and continue along the single-track road for approximately 2 miles. You will come to a track on your right signposted Achnacarron Farm and Achnacarron Boathouse. Follow this track for approximately 1.5 miles to the farm, crossing a cattle grid as you go down to the farm. Keep right at the farm and follow the track passing over another cattle grid. Congratulations - you have arrived! Open the gate and drive down the track to the Boathouse. Heating: the first £45 of heating is included in the rental price. Logs for the stove are included. 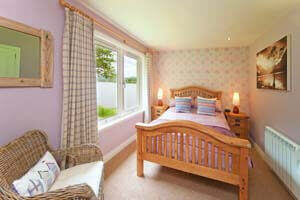 Bed linen and towels are included and exclusive use outside towels. Bathrobes, toiletries and a welcome basket (milk, coffee, tea, biscuits and chocolate!) are provided along with dishwasher/washing machine tablets and loo rolls. Free use of water sports equipment – disclaimer required. Weekly lets, change over day is Saturday. 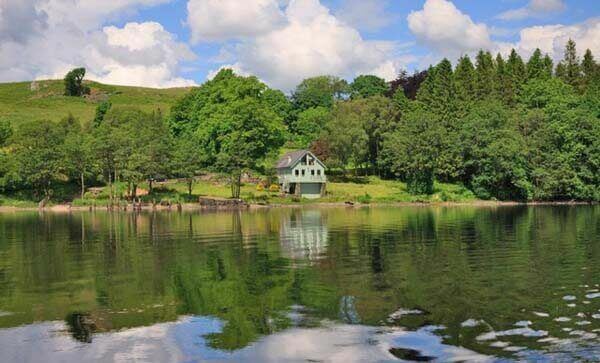 To book this stunning boathouse on the shore of Loch Awe, click the enquiry button below and see availability and rental prices. 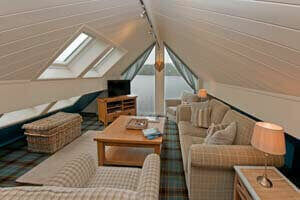 This gorgeous luxury accommodation for 2 is situated right on the shores of Loch Awe in a stunning location. 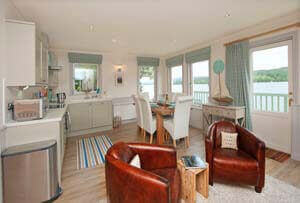 If you're looking for a perfect honeymoon cottage then this will tick all your boxes!